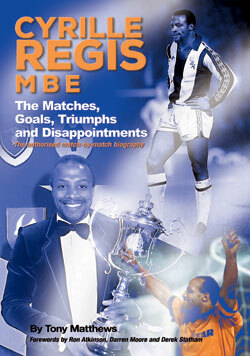 Brief Description: Cyrille Regis, MBE, enjoyed a long career in football. During his playing years, he made well over 750 club and international appearances, scoring more than 200 goals, including 159 in 614 League appearances. Cyrille won the FA Cup with Coventry in 1987 and represented England five times at senior international level. In this fascinating new book, author Tony Matthews tells the story of Cyrille’s long and successful career through 50 important games – although he admits that he could easily have chosen 100! This book covers Cyrille’s life in full, from his early days in the Caribbean, through his school years, playing at non-League level before entering the world of professional football and gaining England recognition. It also tells how Cyrille came close to an early death in a car crash in Spain and how he went on to become a soccer coach and a players’ agent, receiving an MBE in 2008. With forewords by Cyrille’s former manager, Ron Atkinson, and professional footballers, Darren Moore and Derek Statham, as well as a host of other tributes, this is a book no football fan will want to miss. Special Note: The authorised match-by-match biography. This book is also available as an eBook. About the Author: Tony Matthews was born in West Bromwich during World War II and was an amateur footballer with West Bromwich Albion before playing as a semi-professional in Switzerland. He also had trials with Cliftonville (Ireland), Coventry City (under manager Jimmy Hill), St Johnstone, Walsall and Shrewsbury Town. Tony has served in the Birmingham Police Force, was a sports master for 10 years and ran a football programme shop in Handsworth (within walking distance of The Hawthorns). From the late 1960s until 2002, he was the official statistician and historian of West Bromwich Albion FC, opening the club’s first museum at The Hawthorns in 1995. Tony’s personal collection of one million football programmes, including a copy of every single one produced by the Albion (from 1905), resides in the club’s archives, along with some 8,000 Baggies’ photographs, cigarette cards and trade cards, also collected by Tony. As player/manager of the West Bromwich Albion Old Stars (1979-89) Tony has organised hundreds of quizzes over the last 35 years, raising more than £125,000 for various charities. He has also completed two marathons. Tony has written numerous books on football, the first of which, Albion At War, was published in 1976. This second book about Cyrille’s career is the 120th book compiled by Tony himself, although he has been involved in the production of a total of 150 books. Over the last 40 years, Tony has covered 25 different clubs, in one form or another, and has written about several top names in the game, including José Mourinho, Steven Gerrard, Alan Shearer, Ryan Giggs and Ronnie Allen, the former WBA and England centre-forward (who managed the Baggies and other several other clubs). Tony lives in Spain where he is the sports correspondent for Spectrum, the English-speaking radio station, and a columnist for the Euro Weekly News and Sol Times. He also contributes to the Black County Bugle, a weekly newspaper, produced in the West Midlands.